Every diet offers to be THE diet solution – often promising the fastest weight loss in the least amount of time. What we know from all the research is that anyone who follows any diet is no better off in the long term than someone who has never dieted. 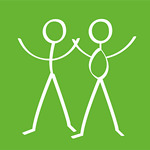 In fact, if you diet you are more likely to gain more weight within a year or two, than someone who did not diet. There is no diet solution, except to stop dieting! When you look at it this way, it can be challenging. It is so firmly entrenched that dieting is the answer to losing weight. Does that mean we will be fat forever? No ... there is an answer, but you have to think outside the box and change the way you think about weight loss forever! True weight comes with true connection. It is as simple as that. "To seek outside of oneself in an effort to resolve any dilemma is a futile and illusional foray, for the root of any ill is due to the fact of the missing inner-most. Forget this not." When we connect with ourselves and make that the most important thing in our lives, what we choose to eat changes, how we look at ourselves in the mirror changes – indeed if we build a connection with ourselves, all our choices will change. So what is true connection?